The story begins here. I live in US and my parents live in Yangon. I am too lazy to make regular phone call but normally, I will always call my mom at her birthday. Unfortunately during 2008, Nargis strike, and my mom birthday is right in the middle of the storm and as we all know it was really hard to make phone call. I tried several hours on that day without success. Well, I feel bad but instead my sister give me an idea to look up for her Burmese birth day and make it up so I try to look for English to Myanmar date translation or conversion but as you may know, most people don't have a slight idea how. The only possibility is getting 100years Myanmar calendar book which may be sold in Myanmar but I do not have access. This lead to my short program in PHP which literally writes the date backward starting 2008 for 100 years. The story has started but it is just a beginning. I suppose many of our fellow Myanmar may have similar problem or may interested in our own calendar system. I hope this web page serve as such tool. When I wrote this Calendar, the only resource I had was a few recent Burmese-English calendars and base on the pattern of the day, the calendar was created. So at this moment, the accuracy of the day translation is still under verification. If you are knowledgeable in this matter, I would welcome any correction or suggestion. Today, due to Georgian calendar as government official calendar, the beauty and usefulness of our own calendar system is slowly forgotten. Many do not use or even have one in their house. In fact Myanmar calendar have many advantages over Georgian or English calendar as it is call in Myanmar. It not just represents days in numbers, it provide many useful informations if you know how to see it. Each name represent either yearly traditional event or celebration or respect to the astronomical bodies movement in the sky. Example, month Waso mean first month that Buddhist monks must start their 3 months long rigorous meditation traditionally at an isolated location. Once Upon a time, there was a king……..
Myanmar calendar was originated 2500 years ago as Buddhist calendar after the First Buddhist council (ပထမသင်္ဂါယနာ). Approximately in 542 BCE, အရှင်မဟာကဿပ and council of monks starts a new era commonly known as Buddhist Era (သာသနာနှစ်). Along with new Era, a new calendar system was created, started or epoch on the year of Buddha passing or ပရိနိဗ္ဗာန်စံ. The calendar itself is base on famous Surya Siddhanta, သူရိယသိဒၶႏၲ , the earliest known astronomical principles. Myanmar Calendar Vs. Buddhist Calendar. Current Myanmar Calendar is a derivation from Buddhist calendar, all is same except Myanmar calendar reset it’s years (သက္ကရာဇ်ဖြို) a few times in the past. I should mention that Buddhist calendar in different countries have slight variation in calculation principles resulting in different dates. In Myanmar, the years were reset 3 times making Myanmar calendar is 1182 years different from Buddhist calendar. According to Myanmar historical records and Buddhist scripture, there were 7 times years were reset. 1. King Kakarrahna, အာကာရဋ္ဌမင်း, reset their current year 1149785 to a new era. 2. King Kuthala, ကုသမင်း, reset their current year 14938560 to a new era. 3. King Iznna, အဉ္စနမင်း, of Devadaha, ဒေဝဒဟပြည် , reset their current year 8645 to new era, အဉ္ဇနသက္ကရာဇ် or မဟာသက္ကရာဇ်. အဉ္စနမင်း is the father of Mayadevi, သီရိမဟာမာယာ ဒေဝီ, mother of Lord Buddha. 4. After the first Buddhist Council, in မဟာသက္ကရာဇ် 148, King Ajatashatru, အဇာတသတ်, Of Magadha Empire, မဂဓတိုင်း၊ ရာဇဂြိုဟ်, start a new Buddhist Era with the help of Mahākassapa, အရှင်မဟာကဿပ. 5. On Buddhist Era 624, King Thamotedayi, သုမုန္ဒရီမင်း, of Thayakyittaya, သရေခေတ္တရာပြည်, reduced the year by 622 and start the new era, သုမုန္ဒရဇ်သက္ကရာဇ် from year 2. 6. On သုမုန္ဒရဇ်သက္ကရာဇ် 562, the 20th King of Pagan dynasty, ပုဂံပြည်, King Papasawrahan, ပုပ္ပါး စောရဟန်းမင်း, reduced the year by 560 and started the new era, ပေါက္ကံသက္ကရာဇ် from year 2. The term, ကောဇာသက္ကရာဇ်, may start using since သုမုန္ဒရီမင်း . But we do not know for sure. Many have negative view about resetting the year or သက္ကရာဇ်ဖြို. The truth is သက္ကရာဇ်ဖြို is performed according to the mathematical requirement or to renew or make the number easy to use. Myanmar Calendar is a lunisolar calendar which ideally represents the movement of sun and moon together. It has 2 cycles independent of each other. Week cycles have 7 days and year cycles have 12 or 13 months. Each month have 15 waxing days and 14 or 15 waning days. The calendar length of time is base on Mahayuga. In this repeating cycle took 4320,000 orbits of sun or 1577917828 circles of days. This turn out average days in a year is 1,577,917,828/4320,000 = 365.258756 days . Modern measurement of average earth orbital period is 365.256363 days. Each year, due to the gravity pull from other planets and actual earth position, the actual orbital time is varied. 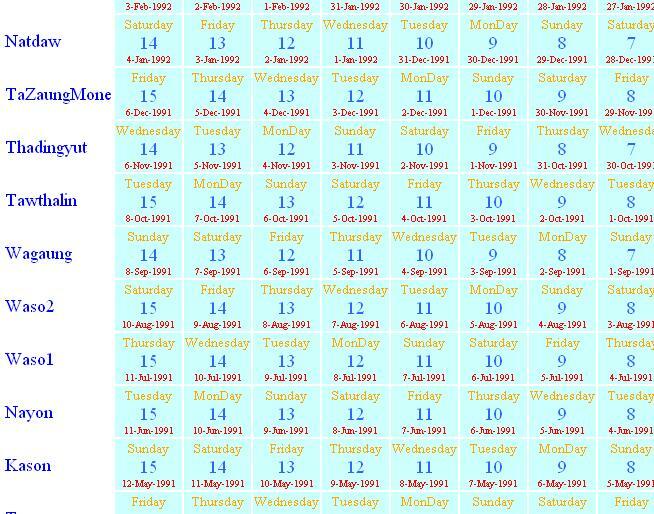 On normal year Myanmar calendar system have 354 days resulting from alternate 29 and 30 days months. In intercalated year, ဝါငယ်ထပ်နှစ်, 30 days 2nd Waso month, ဒုတိယဝါဆို, is inserted after the waso month making 384 days in a year. In second intercalated year, ဝါထပ်နှစ်, not just 2nd Waso month is added, one day is added to Nayon, နယုန်, making is 385 days in a year. In Eurasia(Asia, Europe land mass) base calendars, they seem to share a very similar structure or may be originated from same location. 7 days a week which represent the 7 closest objects in our solar system. 12 months in a year represent the 12 Zodiac sign in the sky which is visible. They even seem to share the name of the day vividly. If you have anything to say please email to me at with title 'information from mmCalendar'.